Architecture and general contracting firm, Tres Birds Workshop in Boulder, Colorado was given the task of mitigating sound for an open floor plan office. After researching sound attenuation, the decision was made to go cellular – resulting in these lovely cork dividers. Thousands of reclaimed corks were stuffed into steel rings to create these organic dividers sculpted to break up sound, provide privacy, and create pin-up spaces. Architecture and general contracting firm, Tres Birds Workshop in Boulder, Colorado was given the task of mitigating sound for an open floor plan office. After researching sound attenuation, the decision was made to go cellular - resulting in these lovely cork dividers. 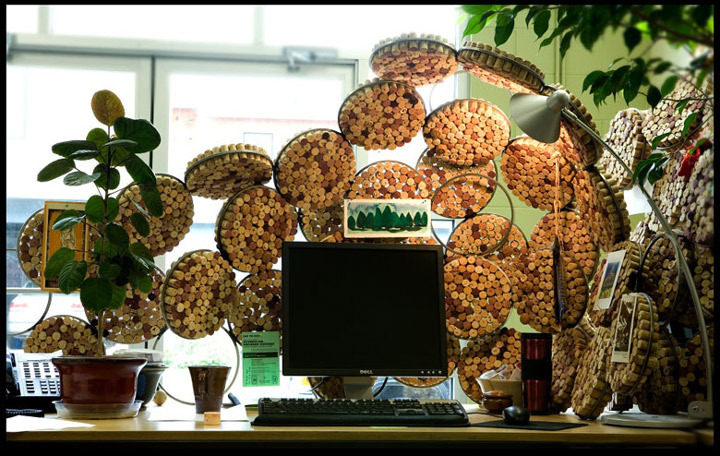 Thousands of reclaimed corks were stuffed into steel rings to create these organic dividers sculpted to break up sound, provide privacy, and create pin-up spaces.